"Let us forget our nomination differences and consolidate votes for NASA." Hassan Joho tells Homabay ODM leaders. - Bana Kenya News, Real African Network Tubanane. Home featured News "Let us forget our nomination differences and consolidate votes for NASA." Hassan Joho tells Homabay ODM leaders. "Let us forget our nomination differences and consolidate votes for NASA." 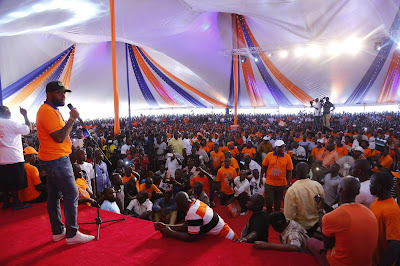 Hassan Joho tells Homabay ODM leaders. The ODM deputy party leader was in Homabay today representing the NASA flag bearer Raila Odinga. The rally and the leaders meeting in the county were to confine and consolidate all leaders and votes for the sake of the NASA coalition. The Mombasa governor said that the people of Nyanza region need to vote for their leader 100% in the coming elections. The independent candidates who are used by the Jubilee to penetrate in the region were not left on the talk. Hassan Joho said the independent candidates need to be screened before any vote is cast for them. "I want to plead with you to stand up one last time. I want to implore you. Canaan is right around the corner. I need you to make sure every single person in the greater Nyanza area comes out to vote on 8/8/2017." he said. "Young people make about 58% of the voters in Kenya. To the youth of Nyanza and Kenya, your future is in your hands. You can decide what that future will look like. Through your vote, you can decide to take us through the path of recklessness, high food prices, high public debt, and corruption. Or you can build a newer brighter more responsible future with Raila Odinga and Kalonzo Musyoka. The choice is within your control." he added.